Several hundred Doosan construction machines have been deployed in one of Saudi Arabia’s key city transportation schemes, the Riyadh Metro project, says their sole distributor in Saudi Arabia. Saudi Diesel Equipment Company (SDEC) said the machines gained favour with contractors because of their high productivity, durability and low running costs, suitability in the kingdom’s climate and terrain, ability to meet tight schedules and reasonable price line. “SDEC’s branch in Riyadh is fully engaged with the metro construction, at present one of the biggest projects in the Saudi Central Region,” said Mohammed Zanaty Diab, Riyadh area manager for the company’s construction division. “With our various product lines, we are one of the primary machinery providers for the project; we supply directly to the responsible consortiums or to contractors and sub-contractors such as Rakd Contracting Co and New Mobility Consortium,” Diab added. Doosan machines SDEC has deployed in the Riyadh Metro project include wheel loaders, excavators, dump trucks and hydraulic breakers and usually come into service in the initial stages of excavation and material transfer. 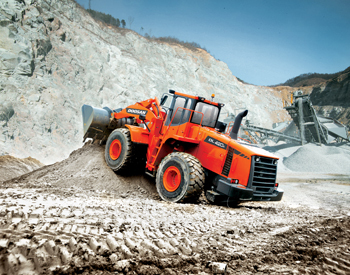 On duty are popular wheel loaders DL300A 5-tonne and DL420A-7 tonne. The former, for instance, is powered by a powerful diesel engine designed for industrial engine segments, with long uptime, generous torque at low rpm, good fuel economy and excellent engine response. The DL300A-5 is a big, agile and smooth performer for a variety of mid-size applications and ideal for aggregates projects and versatile job sites where one needs to move more material every hour. Other Doosan equipment at the metro site includes light and heavy excavators that have operating weights from 21.5 tonnes to 41.5 tonnes and are known to be remarkable for their durability, strength and flexibility and excellent for inner-city projects, yet perfect for heavy-duty as well, and dump trucks, ideal for construction sites, thanks to their excellent driving stability, equal weight distribution and superior traction along with additional load capacity. For the metro, SDEC also supplies hydraulic breakers from Doosan that provide increased strike power through utilising energy generated by piston rebound and crawler drills and rock breakers that are equipped with a powerful rotation unit and engine from Everdigm, another Korean brand with a long history of cooperation with SDEC in both the construction and concrete equipment markets. A key factor in the distributor’s success is after-sales service. SDEC has Doosan-trained and certified product specialist staff who have the capability to respond within 24 hours to any “machine down” requests, said Nigel Lewis, director of the service department. 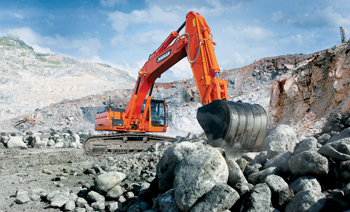 “Staff are equipped with the latest Doosan diagnostic fault tracing tools that reduce machine down time to a minimum. Kingdom-wide coverage is provided to customers from SDEC’s five main branches, which are strategically positioned around the country to ensure that a high level of support is provided quickly. Fully equipped workshops with engine and transmission dynamometers, allow for major overhauls of components such as engines and transmission devices in addition to normal repairs,” says Lewis. A field service team offers services at site with minimum inconvenience to machine operations. Moreover, “Doosan supports SDEC through its regional office in Dubai where their regional product support team is based. Additional support, if required, is rendered by the main Doosan office in Korea,” he adds. SDEC is part of the Abduljawad Group that includes Universal Motor Agencies, Barwill shipping, PLC Arabia, and Saudi Amana Construction.